In the Flagger Training Instructor Course, you'll learn to teach work zone crews standard flagging procedures and how to provide safe passage in and around work areas. Get certified to deliver the Flagger Training Course to your work zone crews. No prerequisites required. Individuals with safety and health responsibilities in highway and street construction; bridge, tunnel, water or sewer construction; concrete, utilities, or paving industries; state transportation, and county or municipal street/public works departments. Controlling traffic through work zones is one of the most important and dangerous operations in road construction and maintenance. The National Safety Council's Instructor Course for the Flagger Training Program will train you to teach standardized flagging procedures. Upon completion of the course you will be able to apply the resources and information learned to protect your own crew and the public. 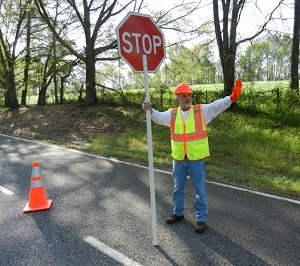 Certification for a Flagger Instructor is contingent upon completion of the Flagger Training Instructor Course, affiliation with an organization maintaining current status as an approved Flagger Training Center and successfully teaching two supervised probationary classes. An organization may become an approved Flagger Training Center by signing a Training Center Agreement.